Scottish Professional Football League chief executive Neil Doncaster has questioned whether clubs should be consulted over fixture changes. The SPFL were accused of jeopardising "sporting integrity" when Rangers and Hibernian's final league fixtures were due to play 24 hours apart, before being reverted back to the same day. Doncaster said the problem was not over fixtures, but with communication. He said: "The fundamental issue is should there be a consultation?" At the time Hearts owner Ann Budge and Hibernian chief executive Leeann Dempster were outspoken in their criticism of the fixture change, feeling all final day fixtures should be played on the same day. The main issue centred on Rangers and Hibernian who were locked in a battle for second place in the Scottish Championship, with the Edinburgh side feeling they would be at a disadvantage if their game was not played at the same time. Eventually all games were played on Saturday 2 May, kicking off at lunchtime. 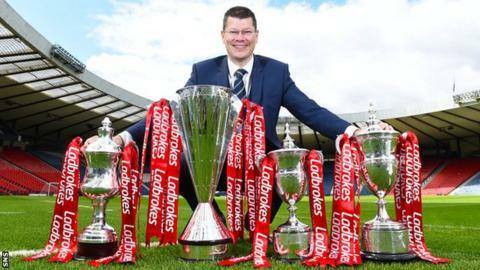 "Originally they were all scheduled to play on the Saturday, but then TV decided to schedule one of those games for broadcasting on the Sunday," Doncaster told BBC Scotland's Sportsound. "At that point Iain Blair [SPFL secretary] could have done one of two things. He could either have moved all the Championship games to the Sunday immediately, or done what he did do which was move that one game and consult with the remaining clubs whether they should move. "Because only one game had moved while Iain was consulting, there were questions about sporting integrity, but the reality was that the Hibs game would always have taken place at the same time as the Hearts game." Hibs chief executive Leeann Dempster was concerned that Hearts v Rangers would be played on a different day than her club's game. Doncaster, who earlier on Wednesday unveiled a new sponsorship deal with betting company Ladbrokes to cover all four divisions, said clubs should not have been surprised at the possibility of matches being moved for TV. "When you sign up to do a broadcast deal, games are going to move for TV," he said. "The issues about sporting integrity were about the failure to move all of the games at the same time to the Sunday. Iain chose to consult with those clubs before moving them games. Perhaps the lesson from this story is to move them all and don't consult with the clubs. "We allowed there to be a mistaken perception that people weren't interested in sporting integrity. There was never a possibility of those games taking place at different times on that weekend. "The Hearts game moved to the Sunday, Iain then consulted with the other eight teams in that division about which, if any, of the other games should move to that Sunday. We fully expected to be moving games to that Sunday. "If that perception was created about sporting integrity, and that perception was created - can't argue with that - then it's a communication issue."